Sketching was made for road trips. Or maybe it’s the other way around, road trips were made for sketching! It’s easy to take a small sketch book and pen or pencil and record scenes of where you’ve been. I know people who have drawn from car or train windows, but I like to sit and savor the scene. There’s no better way to remember special places than to draw them. Wherever I go, I take a bag with drawing supplies and small folding stool. The bag is a funky purse one of my daughters brought from the Paris flea market. It has pockets for paper, sketch book, pens and pencils. 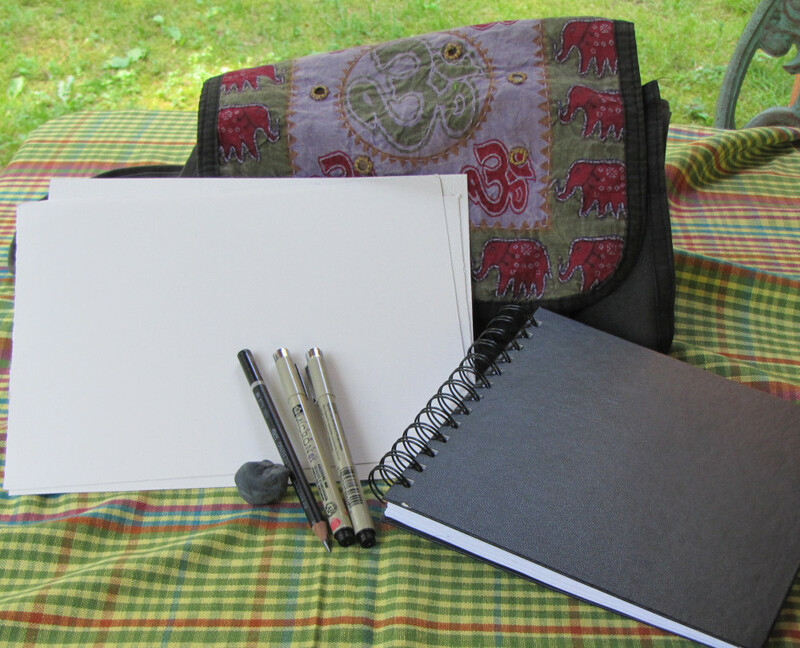 I’ll take a quick minute here and share a few more details about my drawing supplies. I always carry a small sketch book. Right now I’m using a 7” square Pentalic book with smooth paper. It’s great for ink or pencil drawings. I have another book – a Visual Journal for Watercolor – that I can use with watermedia. Quite frankly though, my favorite paper is 140 lb hot press Arches watercolor paper. This paper handles both ink and watercolor beautifully. I cut it up into 8 x 10 sheets to carry with me because I have not yet found a book version with that paper. There are so many options out there, experiment until you find something that works for the way you like to draw. An HB or 2B is my standard for quick sketches and preliminary drawings. I wouldn’t be without a kneaded eraser either – so useful for picking up smudges and dirt marks. As for pens, pigma microns are waterproof and rarely skip. They range in size from a very fine 005 to a bold 08. I’m all about the fine lines right now so my kit contains several 005’s and 01’s. My bag even has room for a mini watercolor palette and brushes. (I’ll go into watercolor supplies in more detail in another post. ) With my bag over my shoulder and my stool in my hand, I’m ready to walk city sidewalks, sandy beaches or mountain trails. Travel sketches comin’ up!